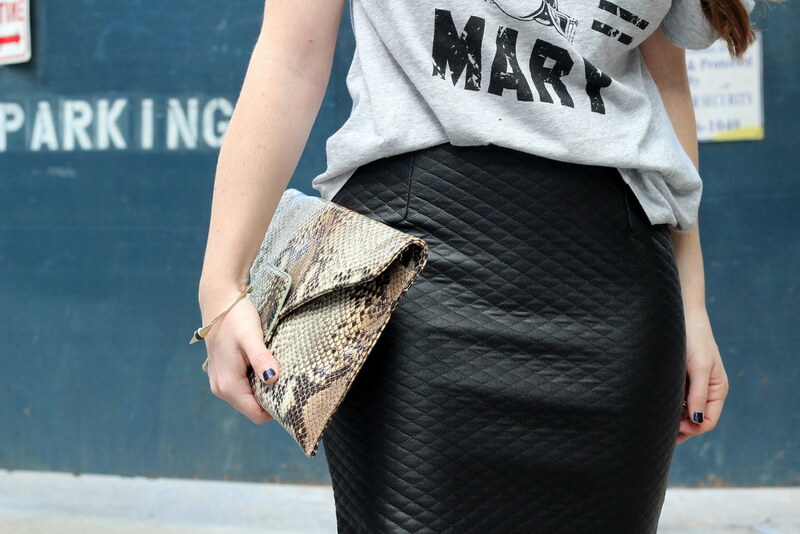 For me, it really doesn't get better than an outfit that consists of some type of faux leather and a soft, comfy tee. Switch it up any way you like and in any combination and I'm a happy girl. Hence my rationale for snatching up this skirt from ASOS. I love that I'll be able to dress it up or down all fall and winter (and, lez be honest, probably spring, too) to create different looks. Oh, and it's super comfy, so be prepared to see it a lot around these parts! OMG that skirt is amazing - I've been looking to add a quilted piece to my closet for fall and this might be it! Love that skirt. Seriously, it's phenomenal! LOVE this look! That skirt + those shoes are perfection! Yessss, loving how you styled this closet staple -- I love mine! That ASOS skirt fits you to a 't'. Very nice outfit. Lovely to meet you during NYFW! I loved that we were both rocking the grey tees with leather skirts at the RewardStyle party! Stay in touch. I love that you paired that skirt with a tee. Too cute. And looks so comfy! Have a great weekend! I feel like this is a totally different look for you! I love it, looks great, and you look gorgeous as always! Love this look - even for a cheeky Friday at the office! I was DYING for those heels this summer but couldn't bring myself to drop the $. Look fab on you though!